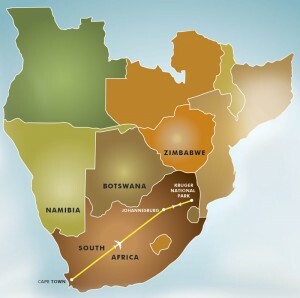 Go See Southern Africa – Cape Town & Kruger Park. Delivering both a cosmopolitan city experience and exciting wildlife adventure, this tour visits the most exciting locales in South Africa! Welcome to the ‘fairest Cape in the World’. Colonial monuments co-exist with delightful modernity in the glorious city of Cape Town. Basking in a Mediterranean climate for most of the year, veteran travelers insist this setting tops even the trendiest resort in the south of France. Certainly… the wines are just as delicious! Relax and enjoy guided sightseeing: a cable car to the top of Table Mountain, a tour of the delightful city and an excursion along the full length of the Cape Peninsula. South Africa’s finest wildlife refuge: Kruger National Park … your safari paradise for 5 exciting days. Nothing compares to the thrill of seeing your first lion on the hunt. Be prepared for non-stop action as you search for the Big Five on morning and afternoon game drives. Open safari vehicles, expertly maneuvered by professional game rangers, allow for close-up encounters and superb photographic opportunities. During the quiet midday, a guided walking safari places you ‘nose to nose’ with the small denizens of the bush. Designed for those who are serious about the wildlife, this program visits two different game lodges within Kruger, in two distinct eco-zones. Mix up the menu, meet your new game ranger and say ‘hello’ to a whole new batch of fellow safari enthusiasts. Tempted to see a bit more? Think about adding Victoria Falls, Botswana or even an exciting extension to Kenya. If you are not starting from Washington DC (Dulles) or New York City (JFK), connect to one of those two gateway cities before relaxing on your overnight flight to South Africa. Two glorious days exploring the city and environs. Ride a cable car up to Table Mountain and tour the colorful Malay Quarter. Pose on the very edge of the continent on a Cape Point tour. Meet penguins, seals and playful baboons. Wing to Kruger Park… wildlife heaven! Daily game drives allow for close-up encounters with elephant, lions, giraffe, buffalo, zebra, hippo, hyena… to name a few. A new part of Kruger, a new lodge… double your game viewing opportunities! Open safari vehicles plunge into the bush in pursuit leopard on the hunt. Don’t miss the midday walking safari!. “Farewell” to Africa. Wing back to Johannesburg and depart. Welcome Back – or connect to your onward flight home! Our first night at Entabeni: cruising on the lake, with a cold drink, warm breeze and impossibly bright stars overhead. We knew this land was magical from the moment we arrived. And so unlike any other area of South Africa. Is it the fabled land that time forgot? Soaring mountains, ancient rock art and a plethora of wildlife; we would not have been surprised to encounter a saber toothed cat!